"Lost Boy - A tale of Krypto the Superdog"
Superboy and Krypto play fetch with a Frisbee in the skies over Smallville. When the Frisbee falls victim to Krypto's "super-bite", they switch to something a little more sturdy, a steel manhole cover. They both appear to be having the time of their lives. Time passes and we are now watching Krypto at a point during Infinite Crisis, when Superboy died and Superman went missing. Krypto lies on the front porch of the Kent household, refusing to eat or budge. He is waiting for his master to return. He is also remembering when Superboy-Prime cruelly punched him hard and called him a bad dog. This experience was traumatic for Krypto, since Superboy-Prime is dressed like Superman, has powers like Superman, and resembles Superman, causing Krypto great anguish, confusion, and despair. In flashbacks, we watch events from Infinite Crisis unfold. Conner is gravely wounded during his first battle with Superboy-Prime. Conner is healed (by Lex Luthor; not shown here). Conner has a romantic interlude with Cassie in the Kent barn. Conner tangles with Superboy-Prime again, bravely tackling Superboy-Prime to protect Nightwing. Conner fights valiantly, but is outmatched. Conner does not survive the battle. As we watch the events of Infinite Crisis, Krypto is remembering them right along with us. Krypto follows Conner in those scenes where Conner is healthy and active. Krypto searches everywhere for Conner in those scenes where Conner is incapacitated or missing. As Krypto searches, he heads to a new place which seems to be the location where Conner and Superboy-Prime had their final battle. Krypto sniffs around, and is reminded of Conner's valiant efforts to save Nightwing from Superboy-Prime. As Krypto sniffs his master's blood, he begins to howl. His howls are heard far and wide. Krypto continues to search, heading to Metropolis, where we see Daily Planet headlines declaring that Superman is missing. 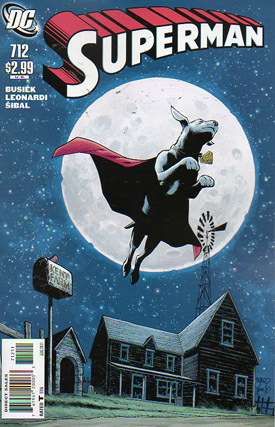 Krypto searches some more and then returns to Smallville, where he parks himself next to the manhole cover that he and Superboy played fetch with at the beginning of the story. Krypto looks sooooo sad, but is prepared to wait a long time, if necessary, for his master to return. Story - 4: This is a simple but heartwarming story featuring Krypto, one of the most beloved characters in the DCU. The premise is simple; tell the story of Superboy's battle with Superboy-Prime during Infinite Crisis; but tell it from Krypto's perspective. This is an interesting concept, well executed here. This story has a lot of heart and pathos. I reveled in the joy of the Frisbee game, and mourned with Krypto after his abuse at the hands of Superboy-Prime. I admired Krypto for his loyalty to his master. This story is referred to as a "lost classic", which means that since Infinite Crisis, it sat on a shelf somewhere until the right moment came along. But this story would have had way more impact had it been released back when Infinite Crisis was going on, and the events shown in flashbacks here were occurring in the other books, and were fresh in everybody's mind. "Meet Los Angeles's newest super hero in the latest Chapter of "Grounded": Sharif! But Sharif discovers that in today's current cultural climate, some people don't want his help - they just want him gone. Can Superman aid Sharif and quell a prejudiced public, or are there some problems too big even for the Man of Steel to solve?" So what happened? This story got pulled at the last minute. Did DC review the story, and determine it was weak? Did DC decide the story was politically sensitive; just too hot to handle? If so, shame on them. Tolerance of other religions and cultures is an important theme that needs to be addressed from time to time. I have a feeling that the story of Sharif is an important one for all of us to hear. Maybe Sharif's tale will be a "future lost classic", and will show up at some point. Art - 3: Leonardi and Sibal do a good job of capturing Krypto's moods, as he experiences highs and lows in this poignant tale. Cover Art - 5: I love this cover! We see the Kent farm with the familiar elements: the Kent mailbox, and the small windmill on the roof. We have a large full moon framing Krypto as he romps in the sky over Smallville. Krypto looks really happy. 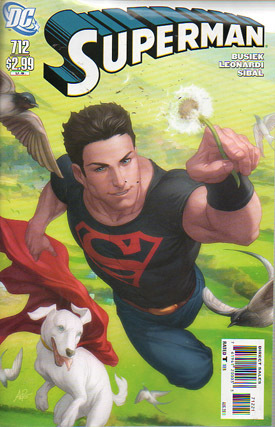 Cover Art (Alternate Cover) - 3: Conner and Krypto romp. Conner holds a dandelion he has just picked. Some birds join in the fun. This is a charming cover, but I really prefer the original.